Imagine meeting someone that you really want to spend time with. You have exactly ten seconds to entice them to want to know more about you; wordlessly, you need to hint at greater depths, thrills and romance, a bit of sadness and a voice that would really speak to them if they'd just give you a chance. That's what it is to be a cover. It's one of the most fascinating and mysterious aspects of publishing to me. I watched my publisher really agonize over the right image; the one they choose was unbelievable serendipity given my novel's origins and inspiration (read here for a blog article on the strange meaning behind the cover of The Luminist: http://redroom.com/member/david-rocklin/blog/a-story-behind-an-image). I'm a huge fan of e-readers (if the convenience factor means that more people turn to a book, I'm all for it), but I do fear we lose a little something by not holding a physical book in our hands. There's a social connection that can happen when we see someone reading. We look at that cover and think, I've heard of that. I should pick it up. Or, that looks interesting, I'm going to ask them about it. You don't have the same possibility of connection with the back of a device. drawing tight a narrative that shifts between the prejudices and passions of Victorian England and those of colonial Ceylon. It binds the destinies of Catherine Colebrook, the proper wife of a fading diplomat, who rebels against every convention to chase the romance of science through her lens, and Eligius, an Indian teenager thrust into servitude after his father is killed demanding native rights. 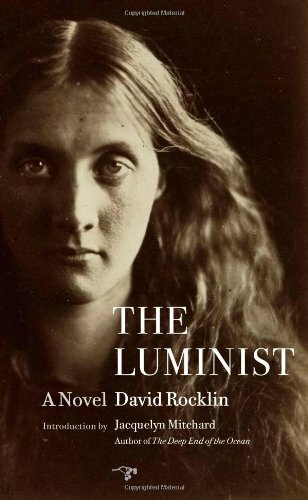 The Luminist is a weave of legend and history, science and art, politics and domesticity that are symphonic themes in the main title, the story of an enduring and forbidden friendship. Catherine and Eligius must each struggle with internal forces that inspire them and societal pressures that command them. Rocklin’s is a bold landscape, against which an intimate drama is poignantly played out. Just in this way, our minds recall in every detail the photo snapped at the moment of pain, while all the lovely scenes seem to run together.